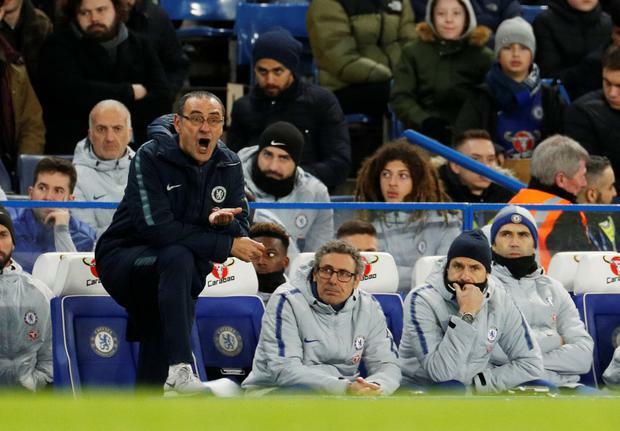 Chelsea manager Maurizio Sarri has admitted he is ‘not sure’ whether he still retains the backing of his players, after their latest limp display results in a 2-0 defeat against Manchester United in the FA Cup fifth round. The Italian’s future has been under a cloud in recent weeks amid rumours the clubs are considering a move to appoint Zinedine Zidane as their next manager, with the comprehensive defeat against a revived United at Stamford Bridge adding to Sarri’s woes. His may now face a make-or-break Carabao Cup final against Manchester City at Wembley on Sunday, with a slide in fortunes inspiring suggestions the Chelsea players are not embracing his brand of football. When asked whether he still had the backing of his players after this latest defeat, Sarri replied: “I think so, I am not sure but I think so. The situation with the players is really good for their relationship but the relationship is not so important. It’s important to play and get the results. “We need to move the ball faster, mentally and materialy. We need more movements without the ball and less actions individually because when you have spaces you can go for the individual action, but when the situation is like the second you must move the ball faster. Chelsea captain Cesar Azpilicueta accepted his side had been well beaten, as he offered no excuses for the result. “It has been a tough night because we didn’t convert our game into chances. We are disappointed, we are eliminated, we are the holders,” he stated. “It is a frustrating night. It has been a tough night for everyone but we know that the fans support us in every moment. “We are used to winning trophies, we have been the most successful team in England for the last few years. The only thing I can say is that we will give everything, we will work hard. There were boos from the Chelsea fans as the final whistle sounded, with former Chelsea striker Christ Sutton suspecting the Italian will lose his post at Stamford Bridge imminently. “Sarri won’t survive tonight. Well he might until 9am tomorrow,” stated Sutton. “If he does survive tonight, do you have to question the owner’s ambition?